Timaru R. H. V. S. Completed 6 years. Height 5 feet 10 inches. Weight 152 lbs. Chest measurement 34-37 inches. Complexion dark. Eyes light brown. Hair black. Sight, hearing, colour vision all normal. Limbs and chest well formed. Full movement of joints. Heart and lungs normal. Teeth - 3 false upper, remainder good. Free from hernia, varicocele, varicose veins, haemorrhoids, inverterate or contagious skin disease. Vaccinated. Good bodily and mental health. No slight defects. Mole. William David MILLAR was a son of Robert and Alice (nee ORR) MILLAR, of Princes Street, Timaru. He attended Timaru South and Timaru Main schools. At the meeting of the South School Committee of 9 June 1915, a resolution was passed of sympathy with the mother of William, an ex-pupil of the school. His name is inscribed on the tablet in memory of ex-pupils who fell in the great war, which was unveiled at Timaru South School on 18 September 1919 in a memorable and unique ceremony. "No nobler boys had left the shores of New Zealand than ex-pupils of the Timaru South School," said one long-term committee member. Before enlistment Willie lived at home with his mother, his father having died in December 1905, and he worked as a bridge carpenter. 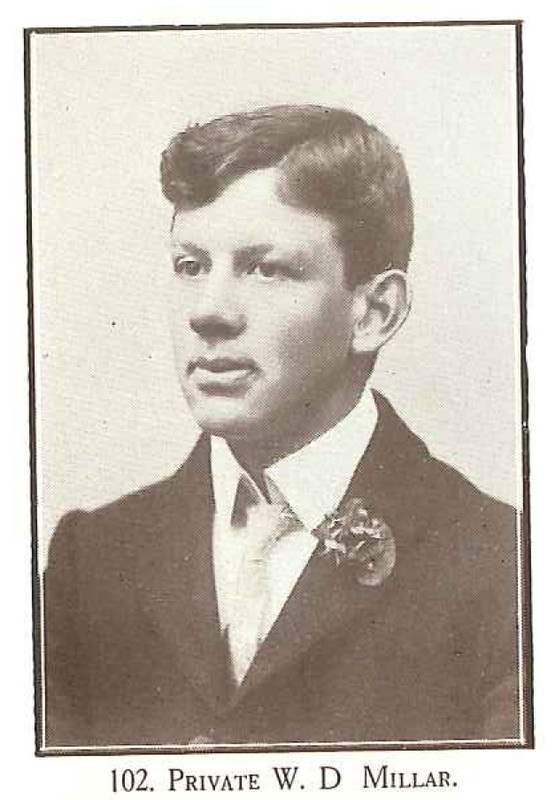 He enrolled and passed the medical examination on 12 August 1914, in a very lively and busy Drill Shed; he was not one of those rejected because they were over or under age, insufficiently developed, had no experience, or were over weight (the regulation weight was 12 stone). William was a prominent, active and valued member of Chalmers Church, where the Dead March in Saul was played at the close of the service in May 1915 out of respect for his memory. And the annual report of Chalmers Church in August 1915 referred sympathetically to the deaths of members who had lost their lives in their country's cause; especial regret was expressed in regard to William's death in seeveral of the reports presented. He was also a Brother of the Loyal Timaru Lodge, I.O.O.F., where his name is inscribed on a memorial tablet. He was a brother of Robert James MILLAR (6/507) who also served in WWI and of Letitia Annie MILLAR who served in the Nursing Corps in WWI. William and Bob embarked together in October 1914, bearing consecutive service numbers and being among the first to enlist to serve their country. Little did they know that less than five months after reaching Egypt William would die of wounds received in action. He was a well built, healthy man, but such is no defence against gun shot. His medals, plaque and scroll were all sent to his mother, and a sum of 26 poounds was granted to her from the pensions fund. William David MILLAR did leave a will, which he had drawn up on 7 October 1912. His eldest brother, John Alexander MILLAR, was one of the executors, and to him were bequeathed all of William's property, real and person. All proceeds of any sales were to be invested and the income from investments to go to his mother and, after her death, to all his brothers and sisters.